Casio's second smartwatch looks smarter, but is a smartwatch really at home in the great outdoors? While Android Wear is much more suited to commuting and work notifications, some of our favourite wearables have been the more rugged outdoorsy smartwatches from Casio and Nixon. After testing the Android Wear waters at CES last year, Casio is back in 2017 with an updated smart outdoor watch. Meet the WSD-F20 which delivers one of the most sorely missed features from the original - GPS. The design is largely unchanged, it’s still a fairly chunky watch, measuring 61.7 × 56.4 × 15.7mm, but light enough weighting only 92g. It's still water resistant to 50 metres, and survive a military-level beating. ...as long as those adventures last less than 24 hours, because the battery life is still around a day with mixed use (presumably less with GPS turned on), or a month if you’re just using the monochrome watch mode. The front is dominated by the same 1.32-inch dual layer LCD touchscreen, with 320 x 320 resolution, which can switch between colour and monochrome mode to conserve battery life. It even comes in the same two colours, orange and black. So that’s all the stuff that hasn’t changed, but what has? 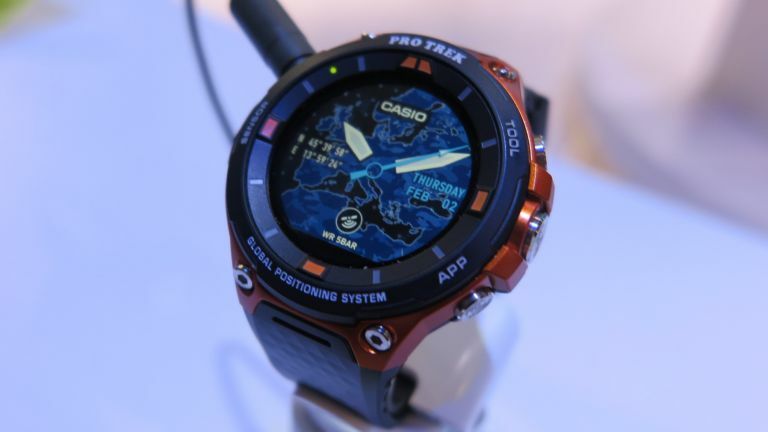 Well, as we mentioned before, Casio’s new Android Wear watch packs GPS. It’s a special low-power GPS which saves battery life, but uses Glonass and Michibiki satellites for improved accuracy. The addition of GPS allows for more advanced features such as Location Memory, which lets you mark a trail of digital breadcrumbs by pressing a button of the side of the watch. There’s also Moment Link, a text message app which replaces your contacts list with a realtime map, allowing you to see where your friends are, and Moment Setter, which sends alerts for tides times or sunrise/sunset times. Finally, the colour maps are available offline, which means you can continue navigating deep in the wilderness away from a cell tower. So there’s a lot to like with this updated rugged Android Wear smartwatch from Casio. It’s got some really intelligent software functions, but the thing that’s holding it back is battery life. If you’re spending one day, or a weekend (at a push) in the great outdoors you’ll probably be alright, but any longer than that and you’ll want something like the Garmin Fenix, which can last months on a single charge. The smartwatch is expected to arrive in the US on April 21st, 2017, and come with Android Wear 2.0 pre installed. It’ll cost $500, so probably around £450 if the WSD-F20 makes it over to the UK (which the original didn't).